Alexander Dennis-owned Plaxton has completed the first phase of developing a new sales centre at the Anston site, which will see the facility cater for all aspects of the Alexander Dennis and Plaxton bus and coach product range, sales and aftercare. Remaining in the existing location, the first phase has involved centralising all activities on to one site, vacating the Anston West site and was completed at the end of June. A new sales office has been created together with a new vehicle display area and work is underway on a new reception and customer facilities, due for completion in August. Following this, further improvements to the parts and service areas are planned which will see the facility become a focal point for all customer-related activities for the complete range of Alexander Dennis and Plaxton products. Plaxton Retail Sales Director Kevin Wood said: “We have been looking at the opportunities to make better use of the Anston facility for some time and it became apparent we could create an improved customer experience and gain more efficient use of the site by centralising all customer facing activities into one area. “We looked at a number of options, including re-location, but as the site has become familiar to coach buyers since it first opened as a coach sales centre more than 60 years ago, it would have been a major step to break that link, so staying here was always the preferred option. The work on the Sales Centre is scheduled for completion in August with the remaining works on the site due by the end of 2012. 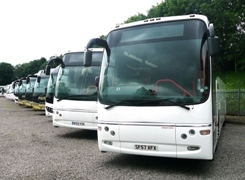 Plaxton is entering the market for premium mid-sized coaches with a new 10.8m model to be launched in the near future. Arriva Southern Counties has launched a fleet of six brand-new Enviro400 double-deckers for use on Sapphire service 101 between Gillingham, Chatham and Maidstone. Arriva Buses Wales has unveiled Sapphire, a new premium service between Wrexham and Chester.